Here’s what I’ve got so far – not necessarily ending up in this orientation and still six blocks to construct for the top. I’m loving how bright this is. Each block has been interesting to make up. Now that I know what I’m doing, I’ve been able to prep the fabric so I have what I need for the blocks and I’ve tidied up the stacks of fabric (have to put them away tomorrow). 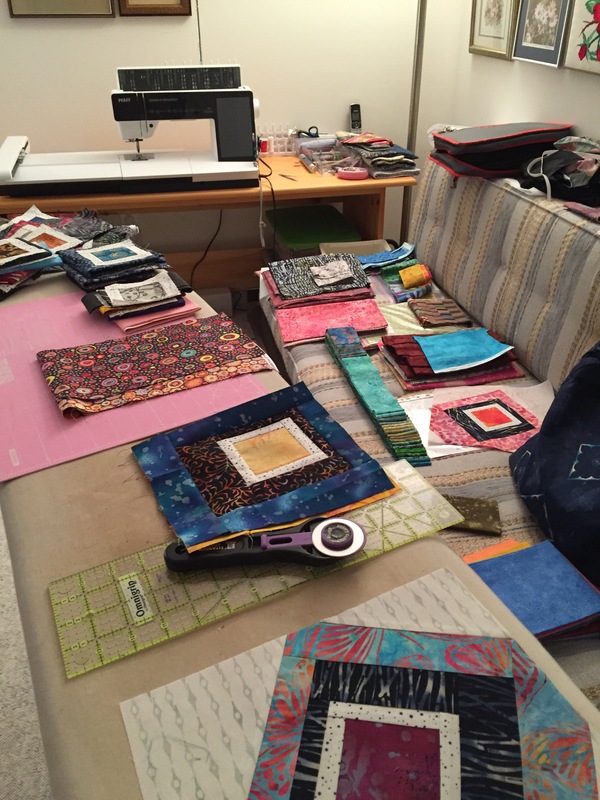 Last night I set up each of the blocks – took a backing square (trimmed all of the fabric pieces to 12″), chose two contrast fabrics and a center and put them to one side, until I had all the backing squares set up. So sewing blocks today went much faster because I wasn’t having make all the decisions as I went along. I’ll get the six blocks for the top finished tomorrow (and perhaps three more to add to the two I have already for the back). I have backing fabric for the quilt which I bought the other day and lots of stuff in the stash for binding. I still don’t know how I’m going to join the blocks – they need some sashing – the question is whether to sash them symmetrically or to do something wonky with them. I’ll have to ponder that a bit when I have all 20 to play with. The quilt was obviously on my mind during the night because when I got up this morning I knew I wanted to head to the fabric shop for some fabrics in a range of bright colours to use as the large “background” element for each block. I have ended up with 1/3m of 25 different fabrics (6 fabrics from my stash). 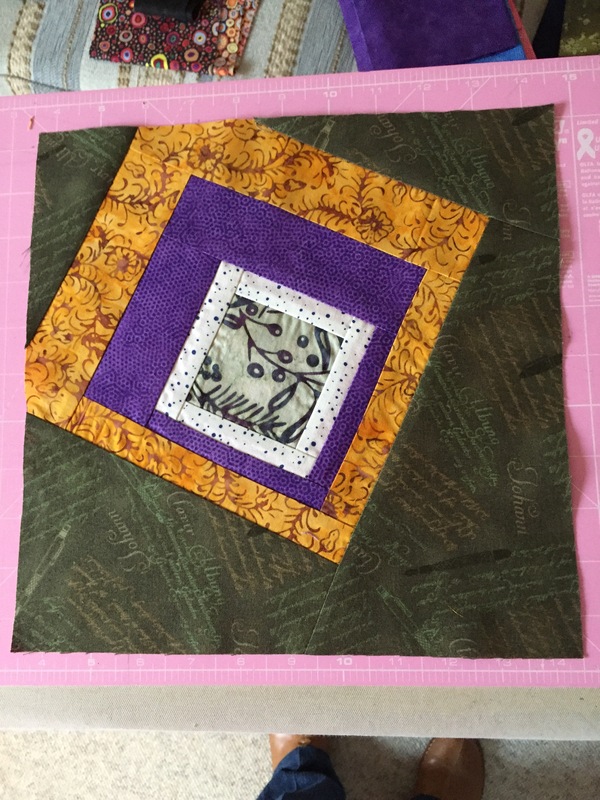 Why so much fabric you wonder – well, I figured out the easiest (if most wasteful) way of building that large block is to start with a 12″ X 12″ square of the “background” fabric. 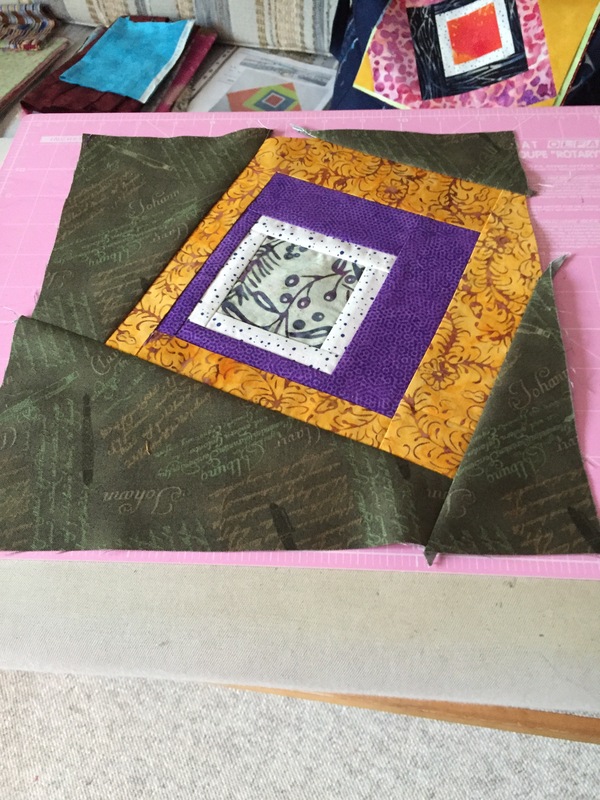 Take the block I want to offset, trim a couple of corners off, then lay it on the 12″ X 12″ square. I found if I pulled the block in 1/4″ from the top and left edges of the “background” fabric I can cut out the triangles needed to construct the large square (leaving me with a large piece of background fabric lying beneath the block as leftover, oh well – it’s large enough to use for something else). Now I sew the background pieces to the block. Once the triangles are sewn to the block it’s easy to trim it to 11″ and guess what – the pattern is aligned – had I figured that out yesterday I could have salvaged the fabric I ended up discarding. 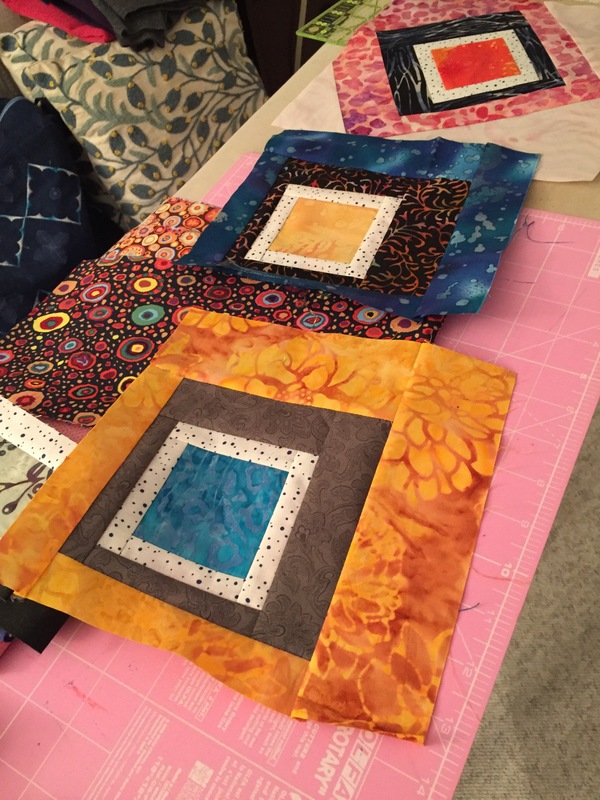 Here are four blocks finished and trimmed to 11″ X 11″. You can see what I mean by “offset” and “background. Each block will be different except for the white with blue dot fabric framing the center square in each block. I’m thinking I will frame each of these 11″ X 11” blocks with a solid white (maybe a slightly off white) narrow frame, and then sash between the blocks. Although a very dark blue framing might work. I’ll have a better idea about what to do when I get all 25 blocks done – 20 for the quilt top, 5 for the quilt back. 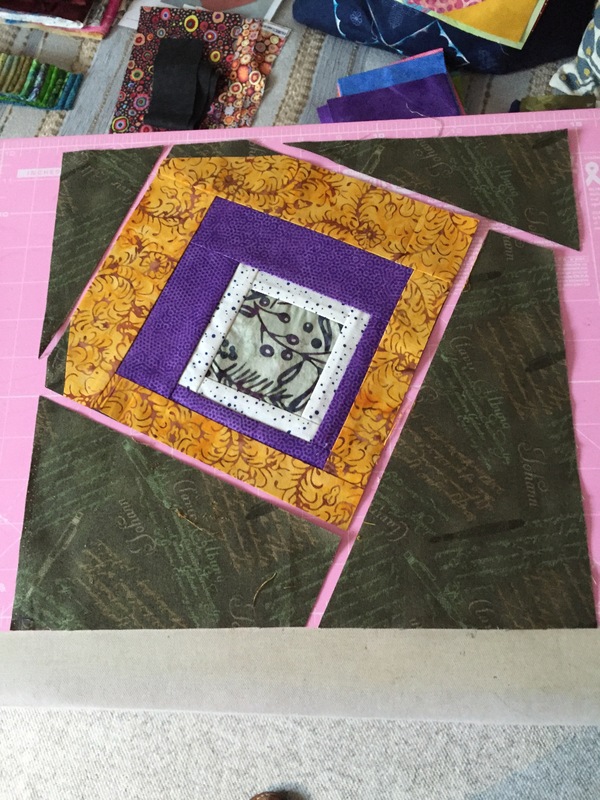 So now I know what I’m actually doing, I can proceed to make up my inner square assembly for the remaining 21 blocks, cut out a 12″ square from each of the background fabrics, and full steam ahead! Yeah. Improvisation is a messy business. This is the current chaotic state of my sewing room. Piles of fabric everywhere. I have an idea I want to execute but not sure yet which fabrics to use. I know the blocks will be similar. The final block size I’m aiming for is 10.5″, but I expect each block will be unique – that the internal construction will vary. 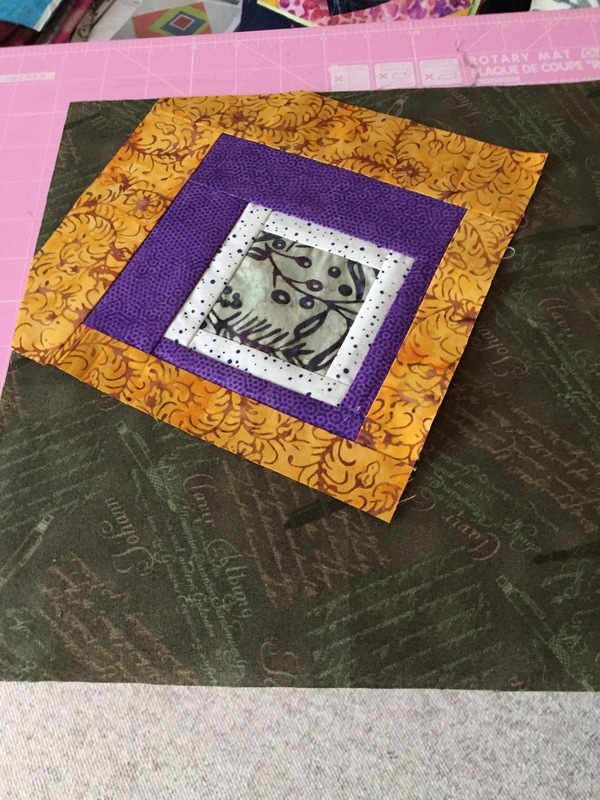 I started this improvisation by selecting fabrics from various boxes, largish pieces, small scraps (enough for a 3″ square). 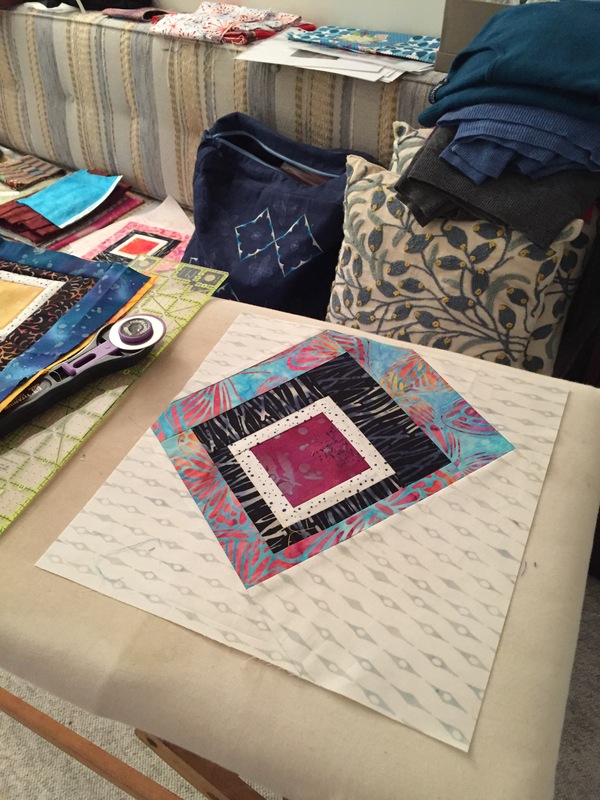 This afternoon I began by choosing 24 different pieces and cutting a 3″ square from each. Here’s the idea – a small square embedded in a somewhat larger square (white with blue dots – the only fabric common in all blocks), which is asymmetrically embedded in a dark square, which is embedded, again asymetrically, in a brighter square, and last, the four layers are set into a final “square” but this time offset and truncated. This was a first try – not entirely successful. I created the final size block I wanted (actually a bit larger for good measure). But directional fabrics aren’t going to work for the last square! I haven’t yet figured out how to piece that final large square in the most economical way possible – it would be relatively easy with solids. With this linear print I was able to orient three of the segments in the same direction but I wasn’t able to get the fourth piece to align without wasting a lot of fabric (I elected to go for economical to see if I could get away with it, can’t). So I will take this block apart and try again. In the meantime I’ve decided to build the 24 blocks as far as the 4th square. 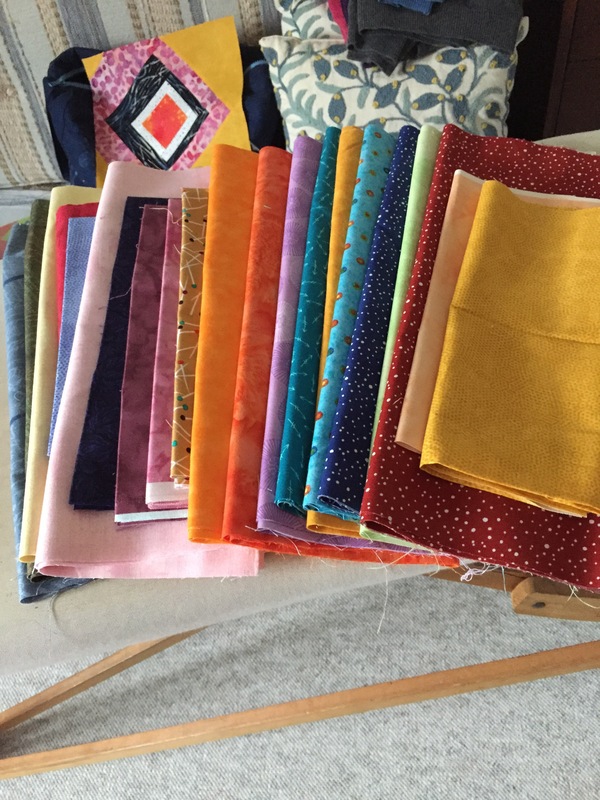 Then, I’ll look at them all and make a decision about fabric for that final square – I am likely going to have to go fabric shopping for a couple of different, yet complementary fabrics. Then there’s sashing and a border – not anywhere near that yet! I love the challenge of problem solving my way through an idea to a completed quilt. Nothing could be more boring than following someone else’s directions. So I’ve learned to be comfortable with the mess involved with improvising. 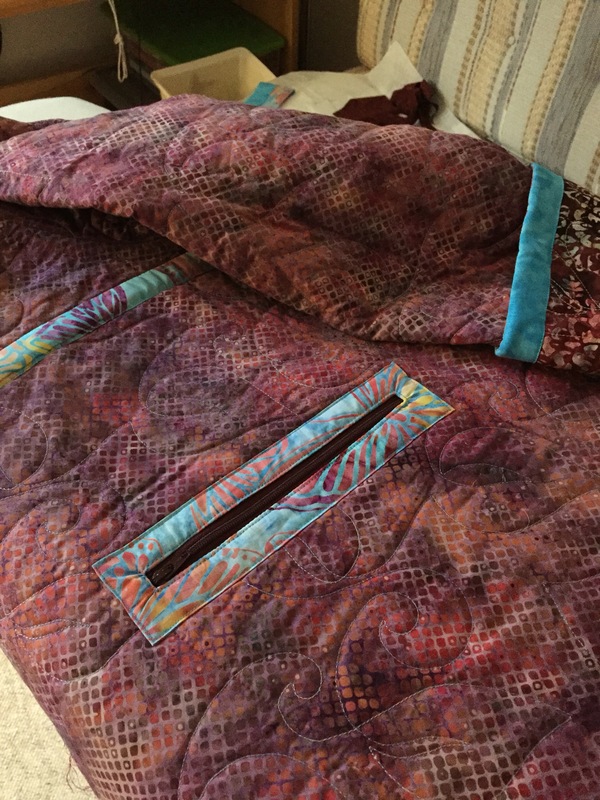 A year and a half ago I made a reversible quilted jacket. I’d had the fabric quilted on a long-arm quilter, cut out the pieces, sewed up seams, bound them with a complementary fabric. The challenge was to figure out a way of creating a faux pocket on the reverse side to allow access to the real pocket on the outside. I achieved that by improvising with a zipper. 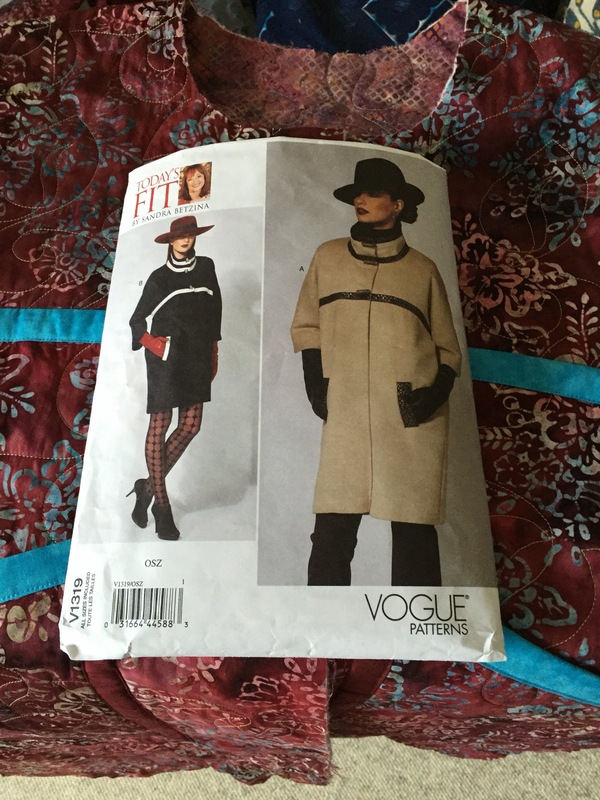 Last spring I bought Sandra Betzina’s coat pattern thinking I could use similar techniques I used for the jacket. I liked the tall collar and the contrasting bands. I thought it wouldn’t be too difficult to accomplish the look. So I had more fabric quilted. 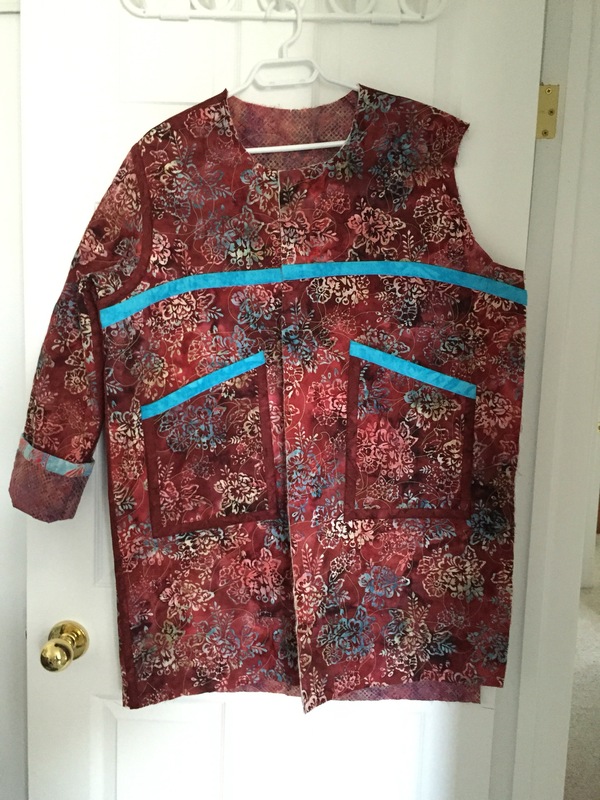 Last week I cut out the pieces with some modifications: I cut set-in sleeves from the jacket pattern instead of raglan used in Sandra’s coat; I cut the body a half inch wider on both fronts and the back at the side seams. I decided not to make the welt pocket in the pattern but to recreate the patch pockets (with zipper on the inside) used in the jacket. I started, following the instructions, by joining yoke and body (front and back) with a contrasting strip. 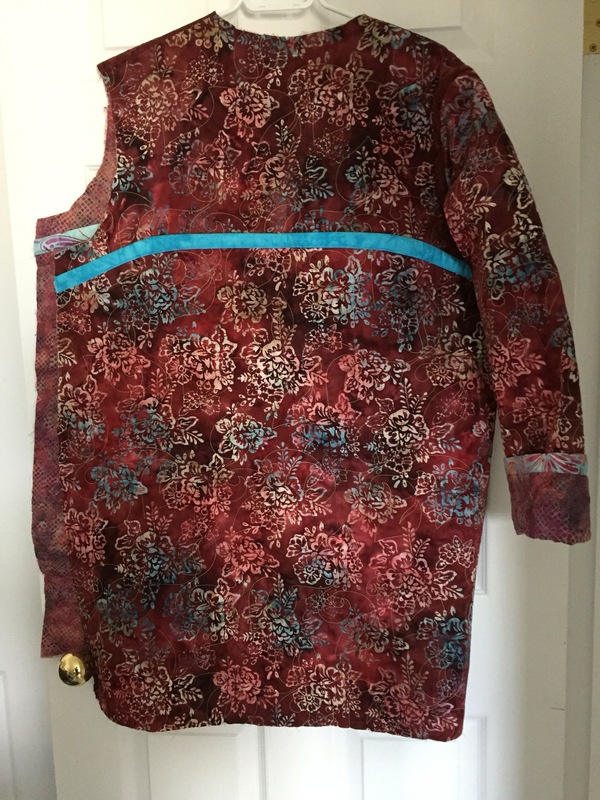 (This was my first mistake – I should have ignored the pattern instructions and thought the assembly through on my own – I should have bound the front edge in the dark fabric before sewing in the contrast!) I’m going to have to take the contrasting join apart, bind the front edges, then restore the contrast band. I constructed and attached the pockets to the outside. The contrast in the back works fine. No need to redo that. Setting in the sleeve and binding the armhole, underarm and side seams went without a hitch. Tomorrow I’ll inset the second sleeve. The collar is ready to be attached – I figured out how to apply the appropriate contrast to each side. I can’t add the collar, however, until the fronts are bound because I want to bind that neckline seam with the appropriate contrasts to each side for the second collar contrast used in the coat pattern! Buttonhole placement will take some thought – I couldn’t easily include them in the contrast seams like Sandra does. 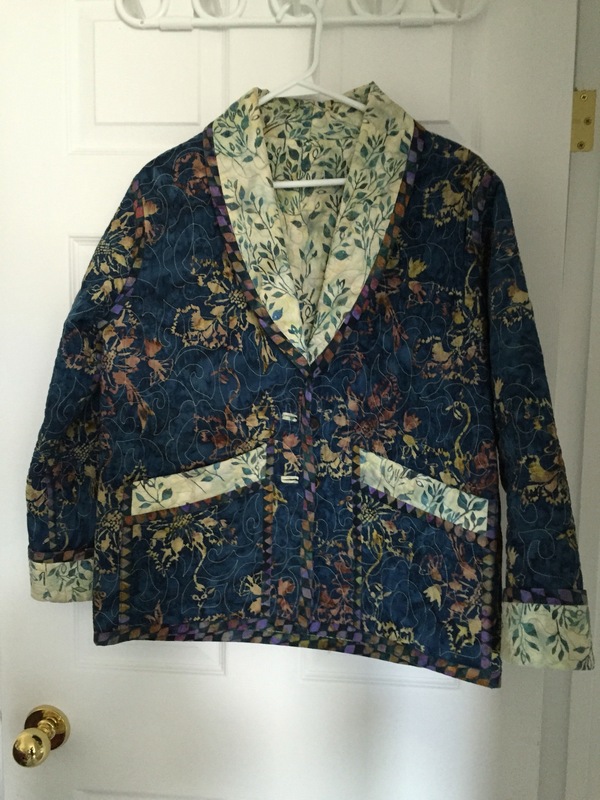 I will have to make bound buttonholes like I did with the jacket (covering the construction with a facing using the side two contrast fabric). I’ll share more after I finish the garment. The photos below show some examples of the kinds of embroidery designs I use to quilt in the hoop on my embroidery machine. 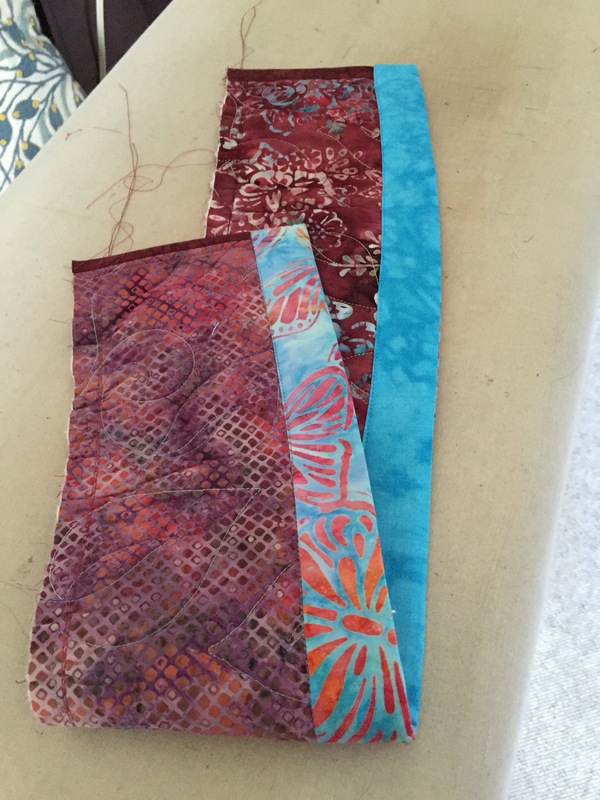 I try to fill as much of the block as I can and where possible I do my best to connect up the embroideries so the quilt looks like it might have been quilted on a long arm quilter!